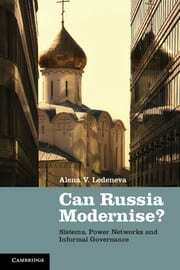 I n her 2013 book Can Russia Modernise? Alena Ledeneva picked out key types of networks that make up Sistema: Russia’s complex, ambiguous and sometimes surprisingly effective systems of informal governance. In the last contribution to a ‘mini-symposium’ Theocharis Grigoriadis assesses the book’s arguments from an economist’s perspective, suggesting that Ledeneva understands the durability of sistema as a series of trade-offs that reduce collective welfare. In her seminal book on informal politics and governance in post-Soviet Russia, Can Russia Modernise? Sistema, Power Networks, and Informal Governance , Alena Ledeneva puts forward a theory of networked governance that relativises the significance of formalised vertical structures and hierarchical decision-making for understanding Russian politics. The prospects for societal modernisation under Putin. While blat networks in socialism facilitated the provision of consumer goods circumventing the formal absence of marketplaces, power networks in post-socialism involved the provision of public goods such as security, justice, and healthcare. The author suggests that market transitions in the former Soviet Union preserved more elements from the economic organization of central planning than we might want to admit, both in terms of people in power and economic practices. As Ledeneva argues, the analysis of informal networks matters, because it is essential to trace the effects of friendships and close relationships on ministerial appointments, judicial decisions and corporate deals. The identification of their existence per se has major theoretical significance, but does not explain current developments in Russian politics. Ledeneva suggests that while continuities in networked governance between socialism and post-socialism exist, what differentiates Putin’s Russia is the even wider spread of informal rules and even higher informational asymmetry between those insider and those outsider a power network. In this sense, Putin’s sistema is at least partially – if not fully – a reversion to the Soviet status quo ante. The Russian sistema is a set of public and private networks that manages public wealth and delivers public goods, thus determining the magnitude of its members’ rent-seeking strategies. While the sistema combines both public and private elements in its enforcement strategies, the hierarchical predominance of public over private interests and institutions is indisputable. In her 2013 book Can Russia Modernise? Alena Ledeneva picked out key types of networks that make up Sistema: Russia’s complex, ambiguous and sometimes surprisingly effective systems of informal governance. In the second part of a three-part ‘mini-symposium’ Geoffrey Hosking assesses the book and its arguments from a historian’s perspective. This is a very good book, but it shares some of the characteristics of the system it describes. One thinks one has grasped an important point, but then on the next page it turns out that point is not always valid, its operation is subtly influenced by other aspects of the system. I would see sistema as ‘the way to get things done’, the allocation of power and resources in order to get things done. It is a system of personal relationships, accepted practices and codes of behaviour (poniatiia), not formulated or laid down explicitly but generally understood. It centres on Putin as President (and did even when he was Prime Minister: persons are more important than institutions), but his actual power within it is not unlimited. He is locked into it and his freedom of action is constantly circumscribed by it. In this sense it confirms Foucault’s dictum about power operating along several vectors: downwards, but also upwards and sideways. Its operation is intangible: there is often no need for direct instructions or commands, because people know how they are expected to behave. Much depends on loyalty and trust, but trust which is limited and instrumental. A trusts B for certain purposes, but not more than that: I trust him because I know him well, his strengths and weaknesses, and what he is good at doing; perhaps I also have some kompromat on him. This is also forced trust, because there is no real alternative.